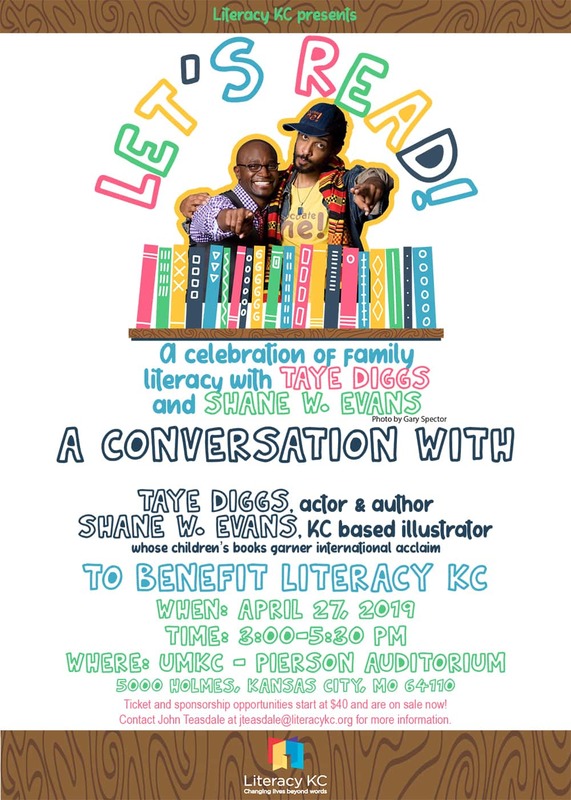 We are thrilled to announce screen and Broadway actor and children’s book author Taye Diggs will be joining illustrator and local artist Shane W. Evans for an event to benefit Literacy KC. Let’s Read! A Celebration of Family Literacy will be held at UMKC’s Pierson Auditorium on April 27, 2019 from 3:30-5:30 PM. We hope you can join us for a panel discussion, Q&A, celebrity story-time, and a post-event VIP meet & greet, where guests will take photos with Taye and Shane. This event will celebrate family literacy and diversity in children’s literature, like in Taye and Shane’s books: Mixed Me!, I Love You More Than. . . , and Chocolate Me!. Sponsorship opportunities include a meet and greet with Taye and Shane and books co-signed by the author and illustrator. This is a can’t miss event! Click here to see sponsorship opportunities.